Wash the rice, drain it and keep it aside. Grind coriander leaves, mint leaves, garlic, ginger and green chillies together to a paste without adding water. Heat ghee in a thick bottomed pan, add cloves, cardamoms, cinnamons and onion and saute well. Add chopped tomatoes and saute well till soft. Then add ground paste and stir well. Add cleaned chicken pieces, coriander powder and turmeric powder and mix well. Add drained rice, garam masala, lime juice, water and salt and mix well. like its flavor.. full of aroma.. 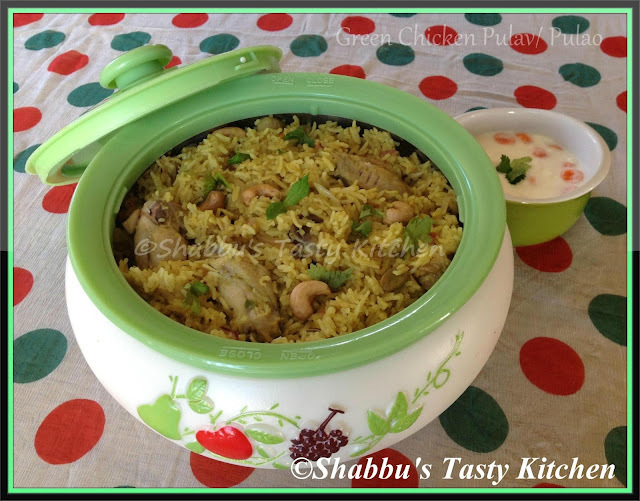 Simply awesome chicken pulao. Loved the way you made it greeny. Who can resist to this beautiful bowl,inviting and super tempting rice. Looks so yummy,Shabbu!! Wonderful pulao!